A one skillet meal that is quick and easy! 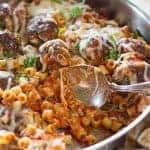 In a medium size bowl, combine all meatball ingredients. Either bake on a foil lined baking sheet at 375 for 15 minutes or brown in your skillet. In large skillet, add 1 tablespoon olive oil, onion and garlic. Saute until onion is soft. Add diced tomatoes, tomato sauce, basil and oregano. Taste for salt. Depending on salt content of your tomato products this will vary. Cook for about 5 minutes until simmering. Cover and cook about 10 minutes, stirring on occasion until pasta is tender. Add meatballs and continue to simmer for another 5 minutes or until meatballs are cooked all the way through. Top with 1/2 cup shredded mozzarella.